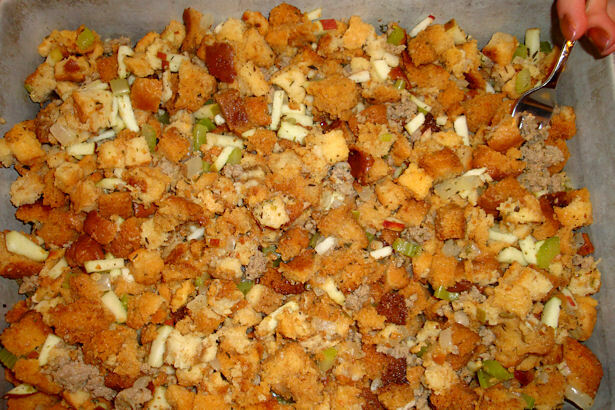 My Aunt Betty makes the world’s BEST stuffing – even Cowboy says so, and he’s got a pretty discriminating palate aka: not used to eating as many different kinds of food as we are. 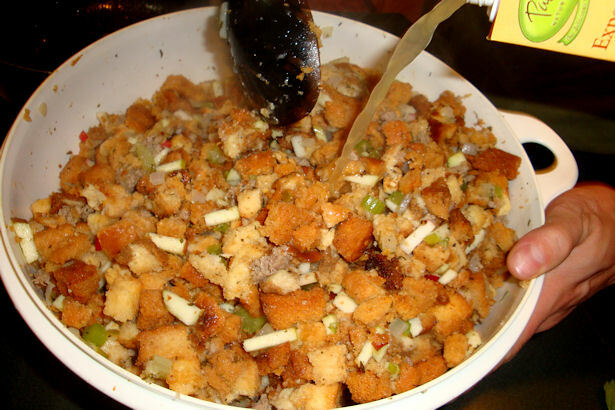 We can’t make any other kind of stuffing now, and I’ll bet once you try it you’ll be hooked on sausage and apple stuffing too! Cut a loaf of bread into cubes and spread on a baking sheet. Place in oven until dry and slightly toasty. We like to use a mixture of different whole wheat and whole grain breads – I think one year we added some rye bread and it was really good too. Allow the bread cubes to cool children playing cards next to the cooling bread are optional, then place in a large bowl. Start browning about a pound of Italian style sausage. We use turkey sausage because it’s healthier and because Princess and Angel Face don’t eat pork, but you use what you like. 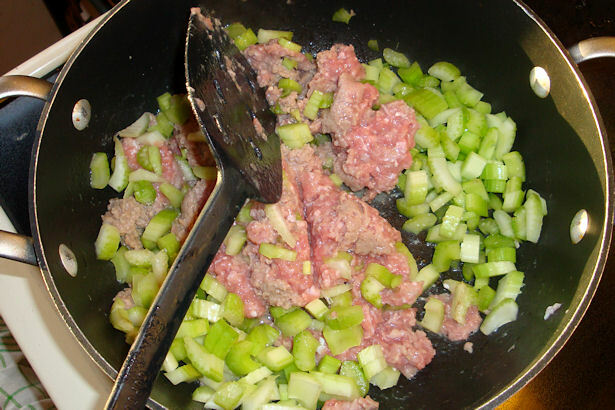 Add the celery to the pan so it can cook with the sausage. Chop the onion and add it to the pan also. When the sausage is done and the vegetables are translucent, add chicken stock, butter, and seasonings to the pan. Bring to a simmer. 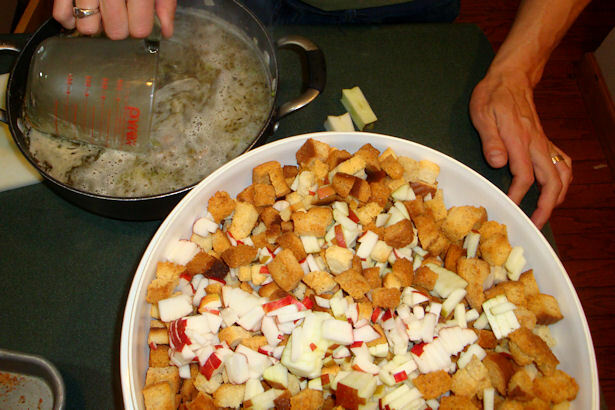 While the chicken stock is heating, chop the apples and add to the bread cubes. 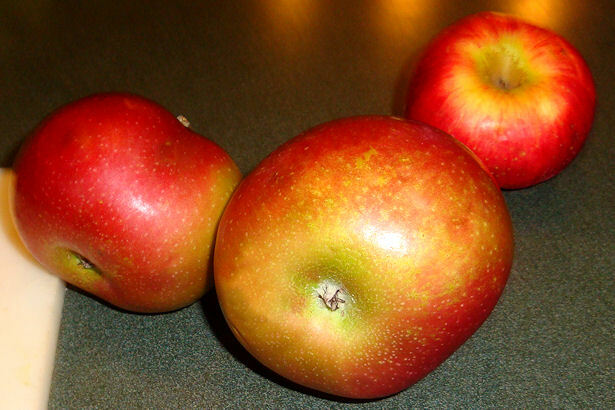 We like to use Cortlands because they’re my favorite, but any baking apple will do. 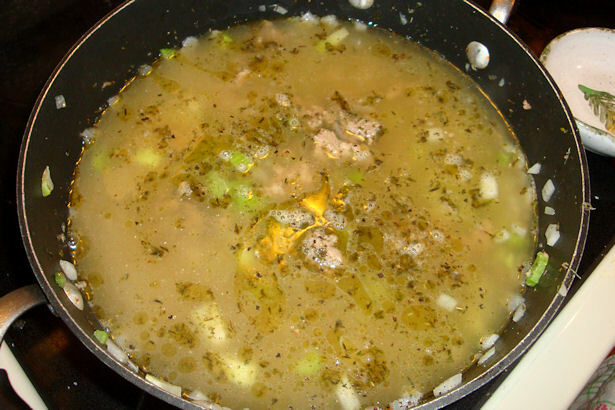 When the chicken stock is hot, carefully pour the mixture over the bread and apples. 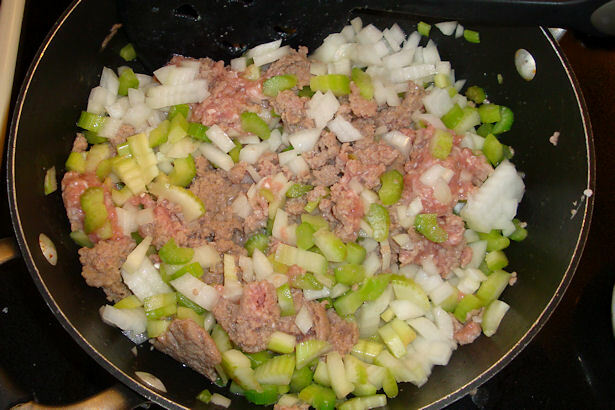 Fold the sausage and vegetables into the bread cubes and apples, being careful not to mush the bread. If it seems dry, add more chicken stock. Spread in a greased 9×13″ pan, and bake. Slice bread into cubes. Place on baking sheet and bake in 350 degree oven for about 10 min, or until dry. Cool. 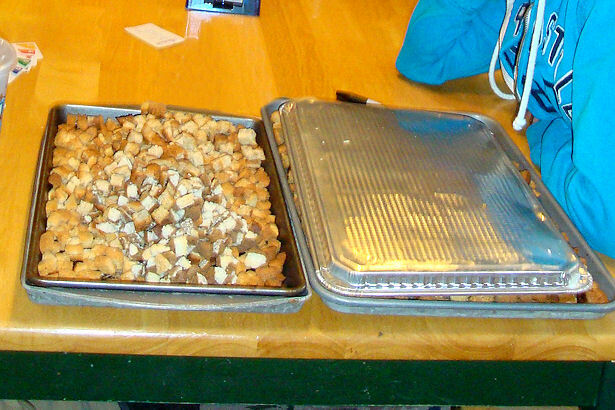 Place cooled bread cubes in a large bowl. 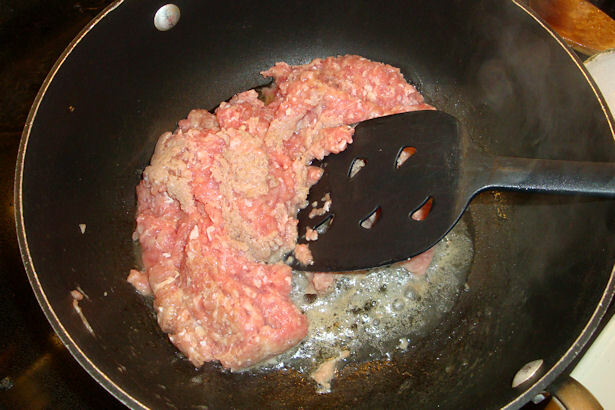 Start browning the sausage over medium-high heat. 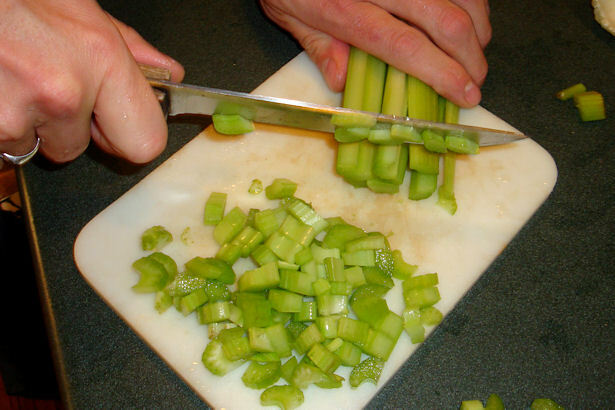 Add the celery and onion. Sauté until the sausage is cooked through and the vegetables are translucent. 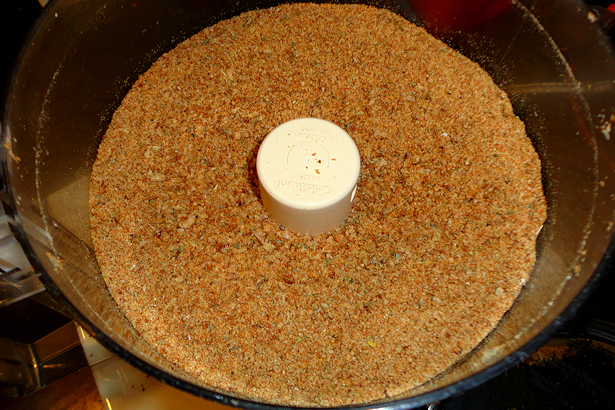 Stir in the poultry seasoning, sage, and as much chicken broth will fit. Heat to a simmer. 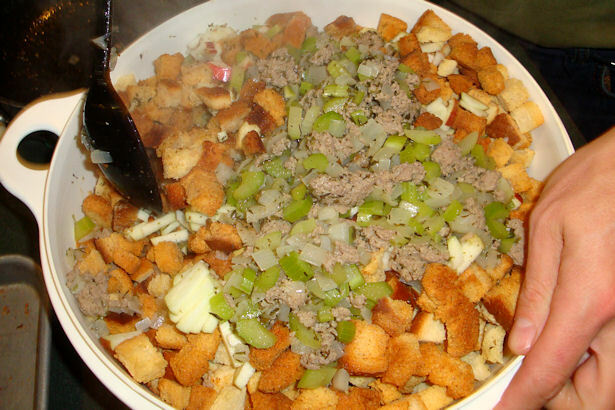 While the chicken broth is heating, chop the apples and add to the bread cubes. 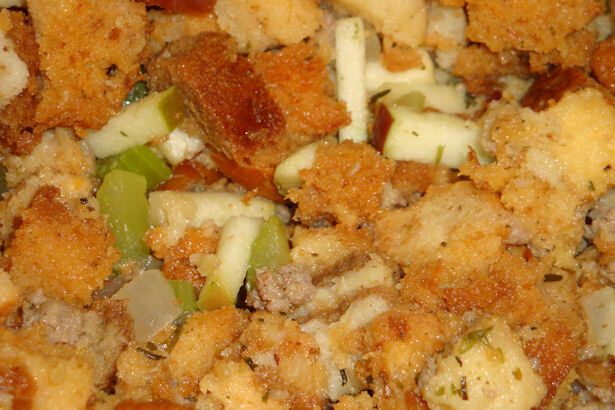 When the chicken broth mixture is hot, carefully add to the apples and bread cubes. Add any of the chicken broth that didn’t fit in the pan. Stir. The bread cubes should be quite moist but not soggy. Add more chicken broth if needed. Season with salt and pepper. Place into 9×13″ baking pan and bake for about 1/2 hour, or until lightly browned on top. When is Your Child too Sick for Child Care? 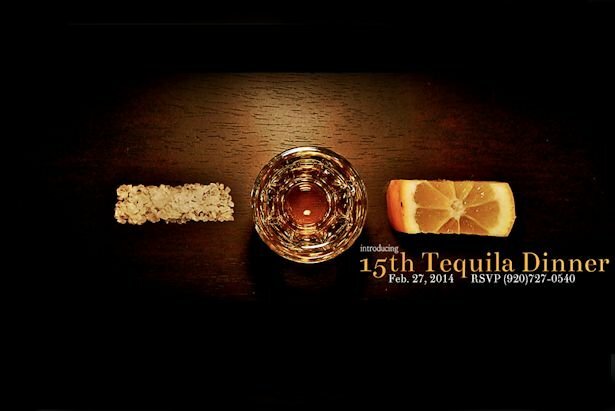 It should taste really good. 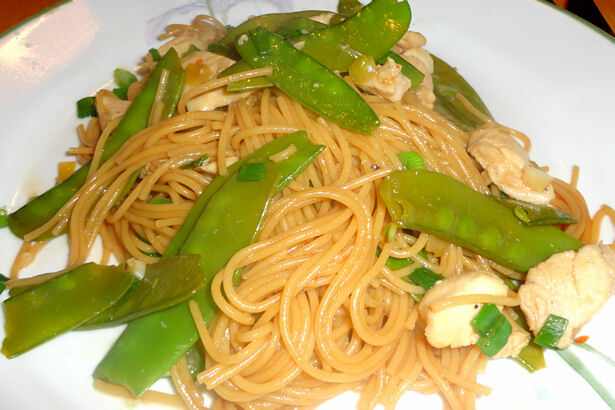 This recipe is to feed how many people? Oooh, good question! I think it feeds about 8-10, depending on what else you’re having and how much they have stuffing. This year we made 2 pans for Thanksgiving with my family, which is about 20 people. We knew that most of the family doesn’t like stuffing but we wanted leftovers; we ended up with about 1 1/2 pans leftover.